TurboSquid has partnered with Japan’s top seller of stock photography to offer TurboSquid 3D models to the rich but largely untapped market in Asia. amanaimages, with 8 million images in a range of categories and 130,000 subscribers, is the leading site for digital photography in Japan. This makes them the perfect partner to give TurboSquid’s world-leading artists direct access to a huge Asian market and offer creative professionals in Japan the highest quality in 3D models. 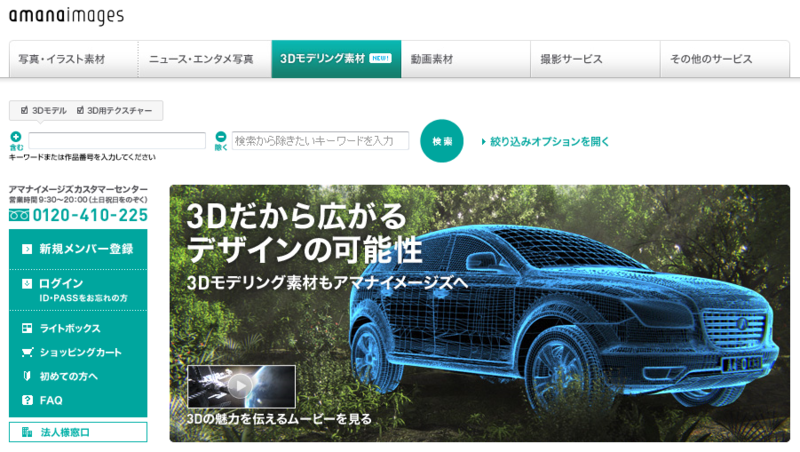 The new joint site went live a few days ago and already features 120,000 3D models and 4,000 3D textures in multiple formats, all ranging in price from 200 to 300,000 yen (that’s about $4 to $3,800). amanaimages has a dedicated local sales and marketing team with years of experience selling to the Japanese market, and they have assembled a full support team to handle all 3D content. Only models by SquidGuild artists and only priced models will be offered on amanaimages. We’ll be sharing more information soon about how SquidGuild artists can find their models on the site and other important details. For now, you can read more here. We expect amanaimages to bring us many new customers in Japan because it offers benefits that no other 3D models site offers: great TurboSquid models on a Japanese-language website created by Japanese, with customer support in their native language and payment methods and options appropriate to their culture. How excited are we about this? Well, Japan is the world’s third largest economy and has a huge amount of 3D production, but Japanese customers have always represented a small fraction of customers buying the high-quality models TurboSquid artists create. And we are pretty sure that’s about to change. The SquidGuild Network is a powerful alliance of exclusive syndication partners selling SquidGuild 3D models. In the SquidGuild Network, artists can publish their models once but sell them through our network of partners with no additional work. They can manage all their products from TurboSquid.com and get one combined royalty payment through TurboSquid. This new partnership with amanaimages is the first fully supported site in the SquidGuild Network, and the synergy of our two companies opens up 3D model sales in Japan in a way TurboSquid could not have done alone. We are now integrating two more stock 3D modeling sites, Falling Pixel and Exchange3D, into the SquidGuild Network. SquidGuild artists can publish on those sites manually now and, starting this month, get royalties in a single payment through TurboSquid for sales at all three sites. Soon the entire content of TurboSquid, Falling Pixel and Exchange3D will be fully syndicated. Read more about the SquidGuild Network here. Why only models created by SquidGuild artists ? I think it is another huge discrimination towards the entire community of artists here on TS. If you would have chose a quality criteria (only diamond, or only ruby and diamond sellers) I would understand. But choosing an absolutely arbitrary motivation (anybody may be part of SquidGuild, so models of a wide range of quality can be on the Japanese site) make me find this totally unfair. Honestly Bublic, do you expect anything less? It is all amount conformity, uniformity and control. Besides, amanaimages is a stock photography website that is trying to expand to stock 3d models. Sounds more of a novelty to please those in the guild. Last time I checked, nothing prevents a Japanese buyer from purchasing 3d models on other, non-Japanese website. Do Germans need their own stock website, Russians, French, Italians? Makes very little sense to me. Do not they also have cultural and language differences? Also Bublic, if non-guild folks sold there, they would only be making something like 35 percent of the sale price. We don`t want a repeat of the famed subscription service. TurboSquid undertook considerable cost and risk to make this partnership happen, so it makes sense that we would offer this only to our SquidGuild members, who are placing their belief in us to bring them all the sales they need. We also did a lot of research to make sure it would be worth the effort. We found that there is a direct correlation between a country’s GDP and the percentage of customers at TurboSquid that are from that country. Not so with Japan. The percentage was smaller than expected. We researched this further and found out that there are several cultures that don’t feel they should have to shop in a language other than their own. China was one, Japan another. The computer graphics community in Japan is huge, which made Japan the logical first step in our internationalization efforts. Italy and Germany have also come up as underserved markets, but Russia is not on the list. Out of all these countries, the discrepancy between what we were selling and what we could be selling was largest in Japan. True but stock photography and stock 3d are completely different markets with different customers.